Our blood moon appears smooth around the edges…. Great photo! Unfortunately we missed it – and a lunar eclipse on top of it – due to heavy, snowy cloud cover. Only that a Facebook Friend posted a message about it reminded me. Thought of it all week then had to get out of bed to take photographs. Oh the things we do. Agreed. 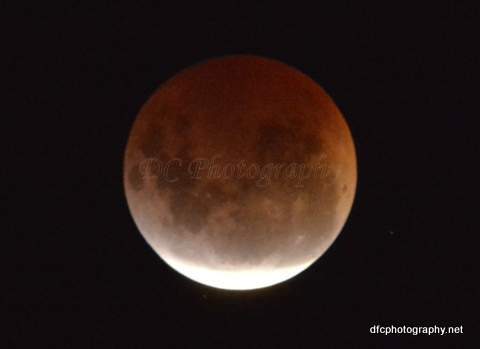 Even if I had only seen the blood moon it was a worth while experience. Great job. It was very bright here until the clouds came at 11 PM when I went to bed. I got it last time though. I would have missed this time also except a FB friend posted a comment which I read just before putting the light out. I posted the shot on several FB sites and two hours later crawled back into bed. Happy Easter, by the way. Well, we shan’t see it here in Florence, where the spring rain is falling steadily and smoothly. Although we are getting to a stage where we would gladly trade a blood moon for rain. It’s a pity..even back near my home town it is cloudy and wet according to posts in one of the FB groups I have joined.